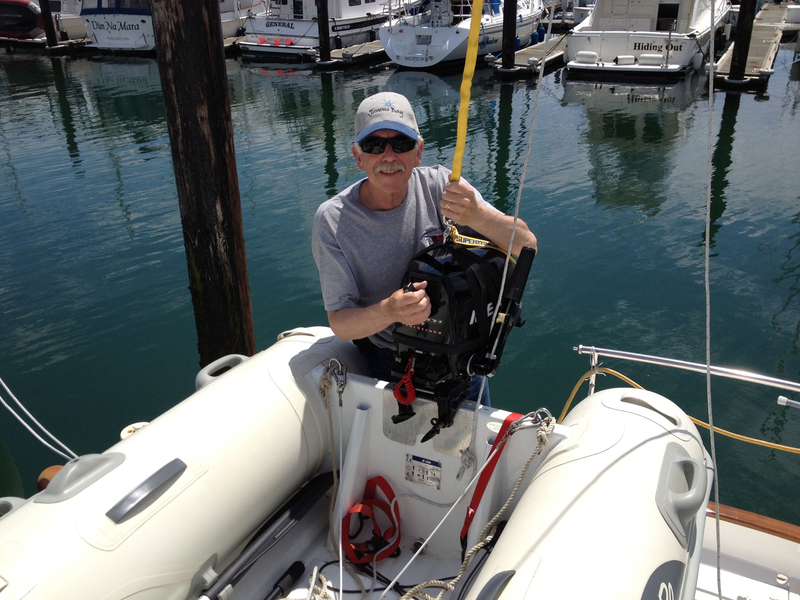 Jim guided the outboard as we used the Superwinch to lift it from the dock so he could attach it to the dinghy on deck. My job was to press the hoisting button on the winch remote. A close up view of Jim attaching the outboard to the dinghy. The other end of the yellow hoisting line is connected to the drum of the Superwinch. Today we got our chance to actually use our new Superwinch! At high tide this morning, Jim brought the dinghy outboard motor down from our storage unit. We store the outboard in our storage unit every winter, then get it out and put it on the dinghy when we’re ready to use it. 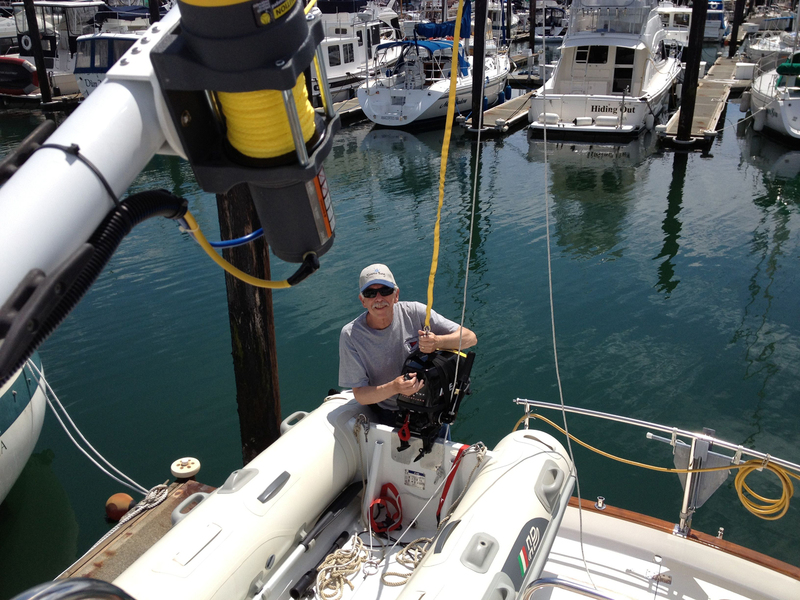 Since the dinghy is stored on the aft boat deck, we have to lift the outboard from the dock to the deck. In the past, we’ve lifted the outboard from the dock slowly by cranking the manual winch, but today we let the Superwinch do the job. It quickly got the outboard up and onto the deck where Jim could attach it to the dinghy. Neat! We’re very pleased with how our new system performs. 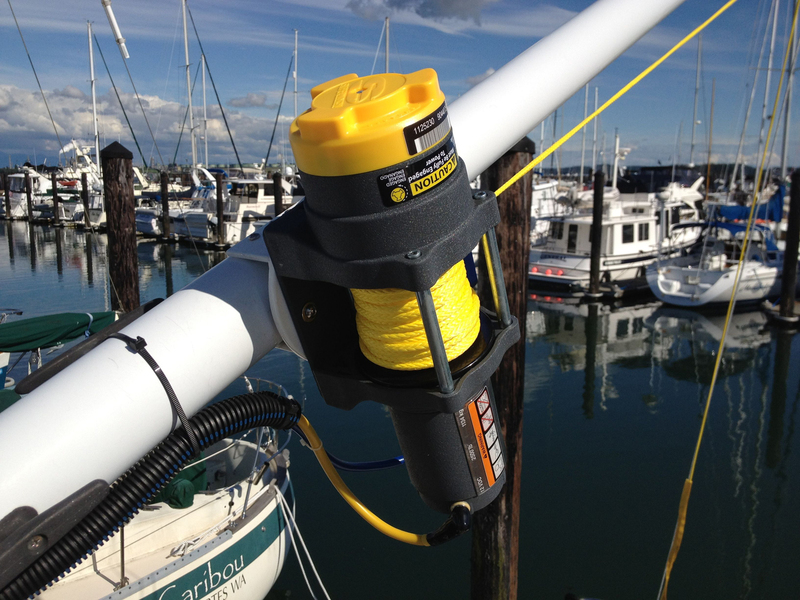 The Superwinch mounted on our boom, with the dinghy hoisting line wound on the winch drum. The yellow line looks like polypropylene, but actually it is AmSteel. A close-up view of the AmSteel hoisting line wound around the Superwinch drum. 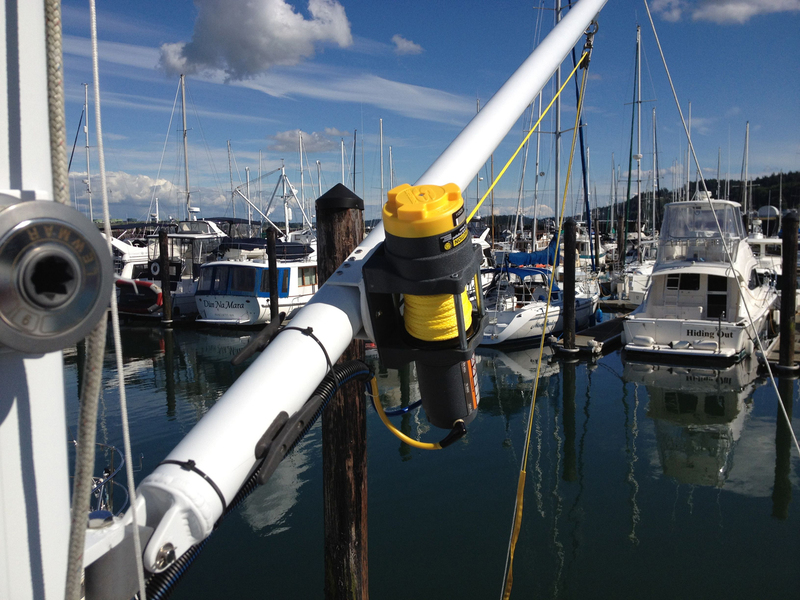 Our electric dinghy hoisting winch system is getting closer to being complete. Jim wound the hoisting line onto the winch drum today. The yellow line we’re using came with the Superwinch. It looks like polypropylene, but actually is a product called AmSteel. It is 3/16 inches in diameter with a breaking strength of 5400 pounds…more than strong enough for our 275 pound dinghy and outboard motor! This line sounds pretty good to us. It’s also lightweight and easy on the hands. Jim working on the wiring in the electrical panel for the winch system on/off switch. 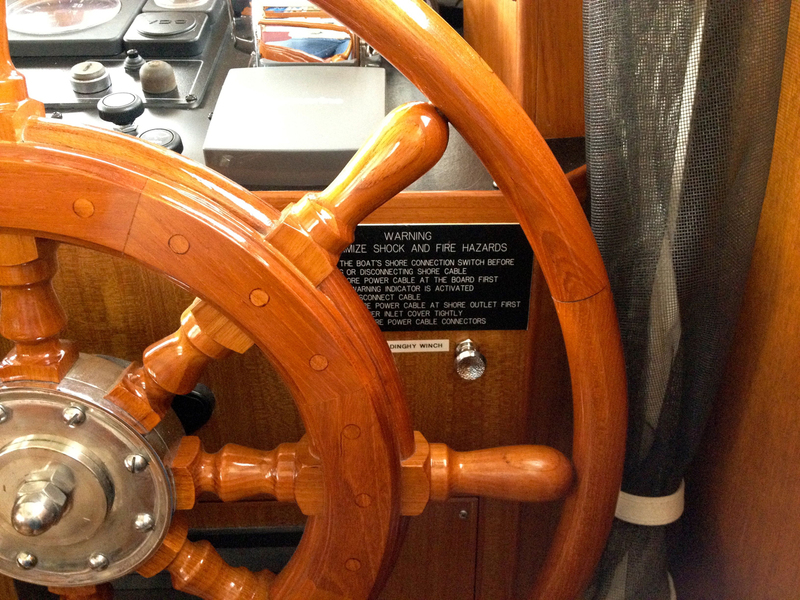 The winch system on/off switch is a push-pull switch, and we mounted it behind our steering wheel, just under the electrical safety placard. 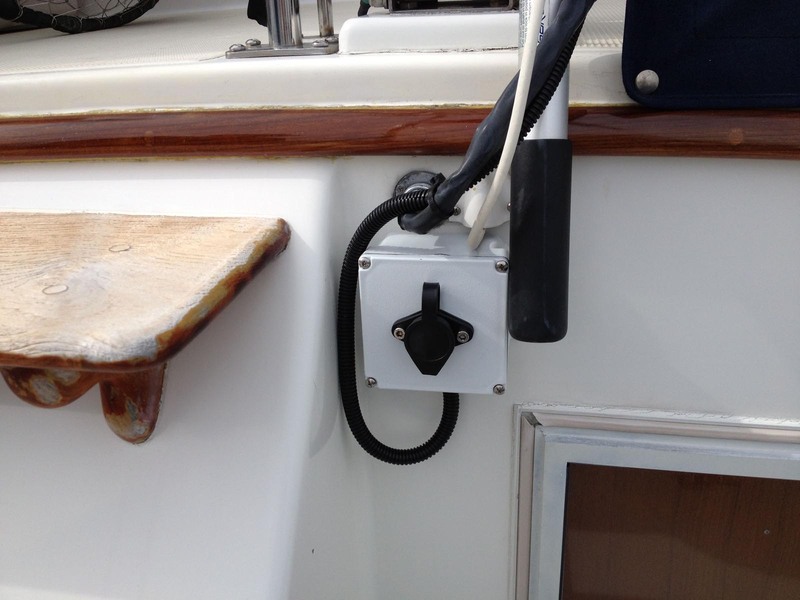 We mounted the battery charger for the winch battery in our flybridge storage locker, near the winch battery. The green light means the battery is charged. 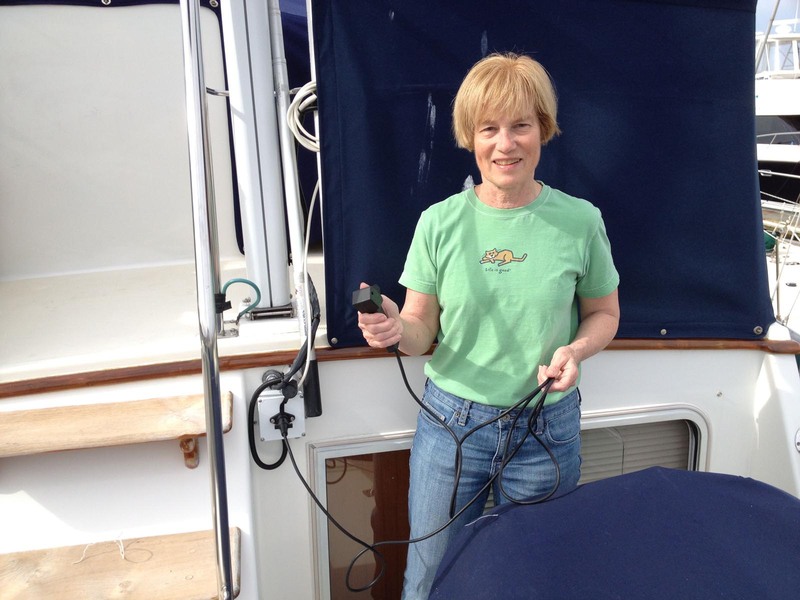 We were trying to get the wiring for the electric winch finished before Jim’s eye surgery on June 21st, and we did! We found a place for the system on/off switch behind our steering wheel, where we can easily reach it to turn power on and off to the winch. This switch provides power to the solenoid coil. Next we ran the cables from the winch motor to connect them to the battery. 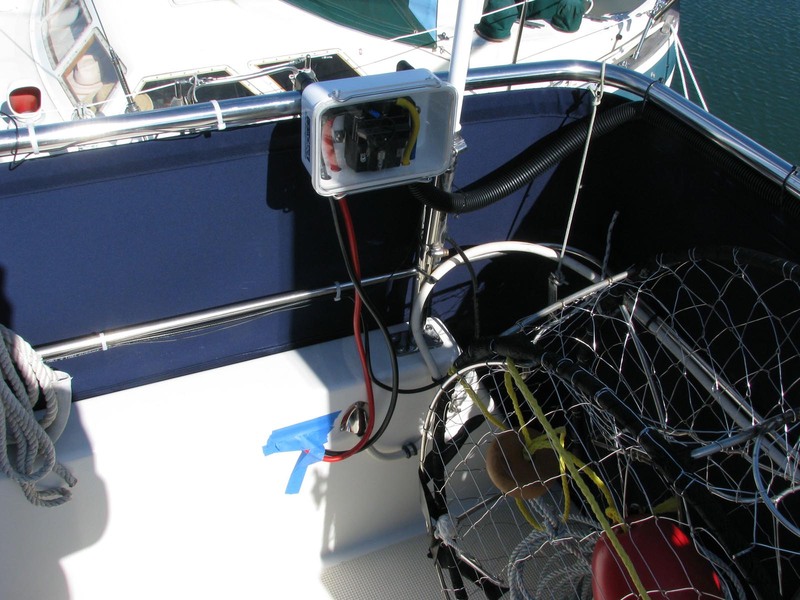 Then we mounted the battery charger on the inside wall of the flybridge storage locker, near the winch battery, and connected the charger to the battery. Then we were ready to power up everything to do a system test. It all works! 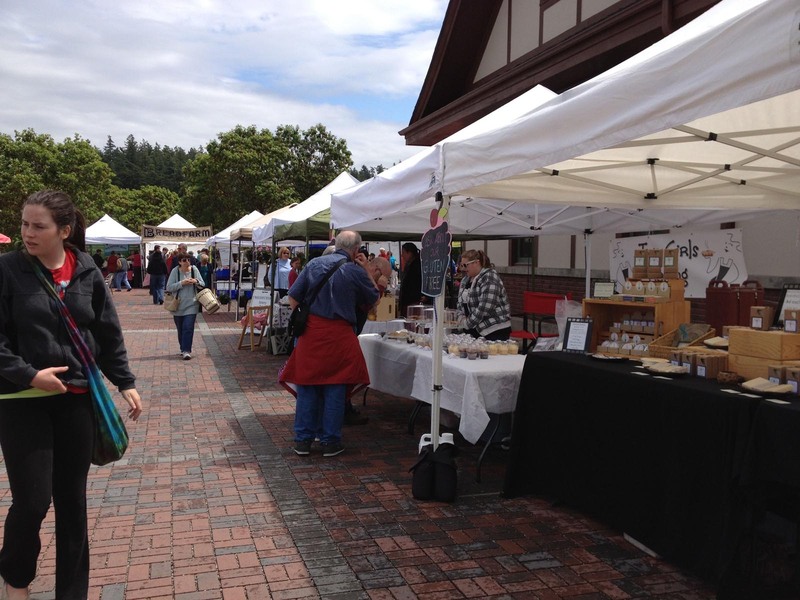 Some of the vendors at the Saturday Anacortes Farmers Market a couple of weeks ago when it was sunny. 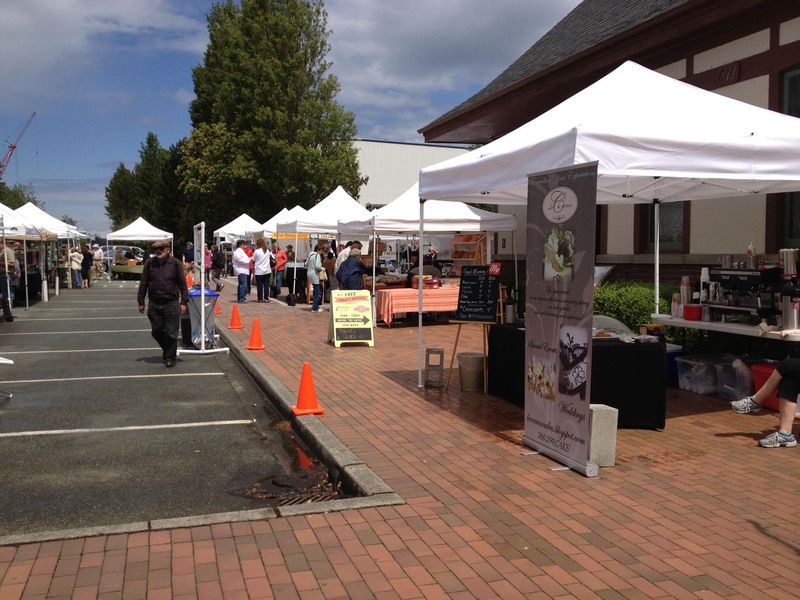 Another view of some vendors at the Anacortes Farmers Market on a previous day when it was sunny. 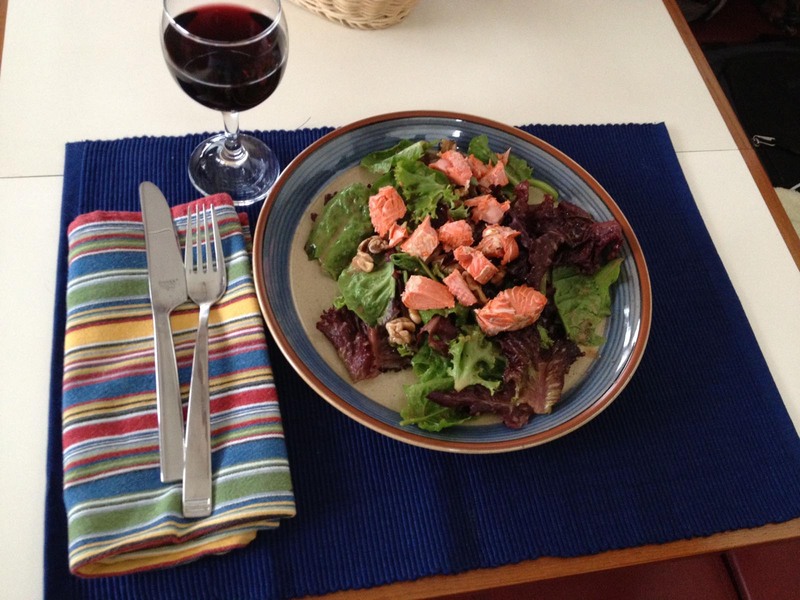 Smoked Copper River sockeye salmon on fresh salad greens made a wonderful dinner. What a washout. Rain was forecast for today, and it pretty much rained all day. Not hard. Instead, the normal Seattle-style drizzle that kept things…and us…soggy all day long. We got out our raincoats this morning and walked to the Saturday Anacortes Farmers Market, www.anacortesfarmersmarket.org. Fortunately, it wasn’t very windy, so all we had to contend with was the rain. We got cranberry and almond scones for breakfast, and fresh salad greens and olive bread for dinner tonight. We recently received a gift of smoked salmon from Ekhard, one of my friends from high school. He has a smoker and had smoked a bunch of freshly-caught Copper River sockeye salmon and was gracious enough to share some with us. So, dinner tonight will be smoked salmon pieces sprinkled on fresh greens tossed with balsamic vinaigrette dressing. Yum. 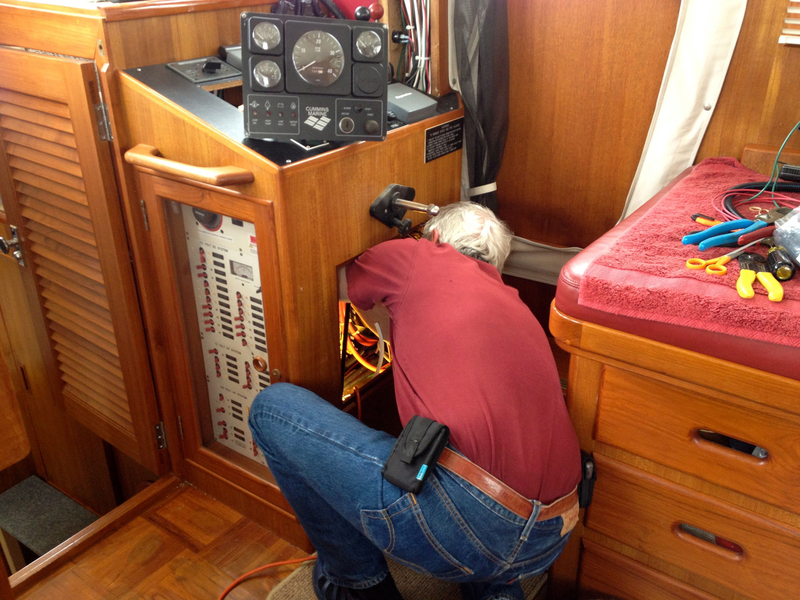 Jim’s project today was to get AC power up to the flybridge for the battery charger for the Superwinch battery. 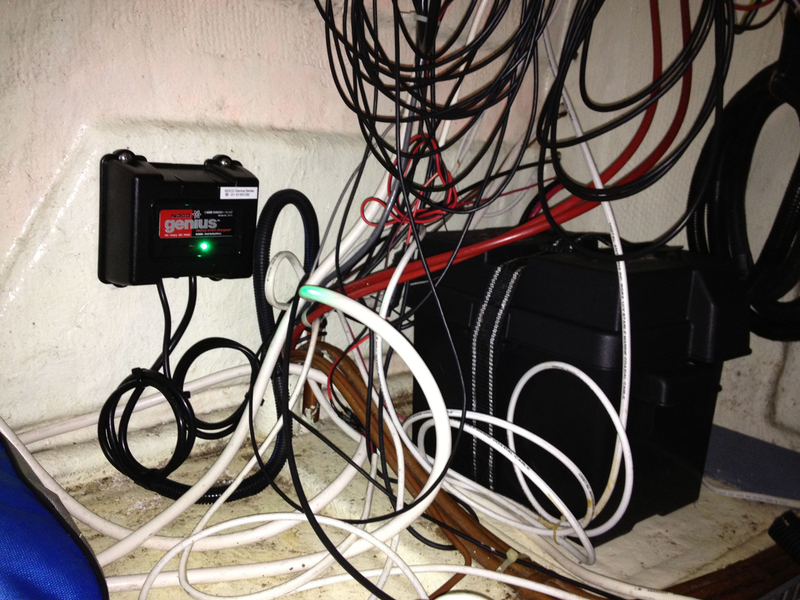 However, the wire-way between the main deck and the flybridge is already chock-a-block full with existing wiring! Spent most of the day trying to figure out what to do. Finally identified a possible workaround that we will try tomorrow. By early evening, the rain stopped, and the sun poked out for about a half hour around 1800, which warmed things up so quickly that dense fog is forming all around us, reducing the visibility between Anacortes Marina and Cap Sante, extending out into Fidalgo Bay. We can hear foghorns out there, and the fog is closing in and getting thicker. Should be a very foggy night. Alice shows off the Superwinch remote control, which has been connected to the plug-in, as it will be when the system is operational. 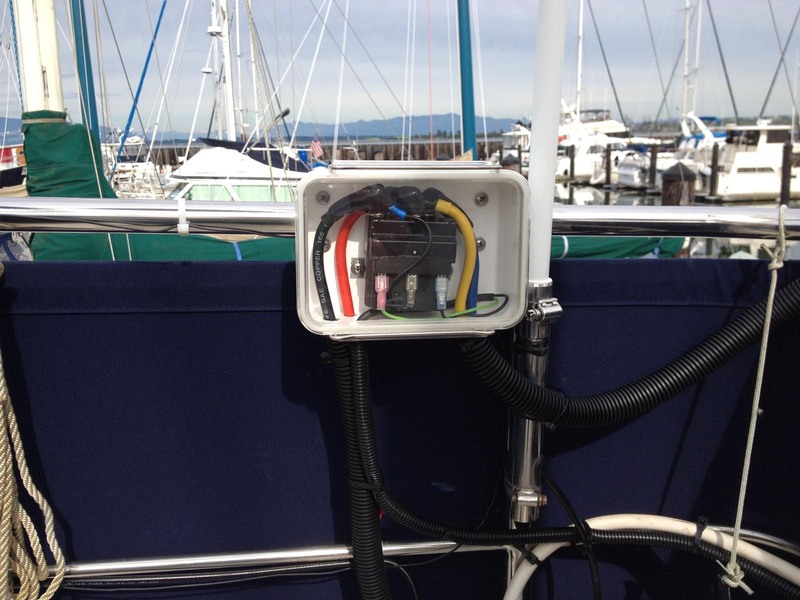 A close-up view of the plug-in for the Superwinch remote control, mounted in the junction box on the cabin, and with the wiring installed that connects it to the solenoid. Another view of the solenoid, now with all the wiring connected…on the left, the wires lead to the battery, in the center to the remote control, and on the right to the winch motor. Great weather today! Blue skies and sun all morning gave us perfect weather for a walk to Mary Ann’s Kitchen to have breakfast with Ann and Bob. We think Mary Ann’s is one of the best places in Anacortes for breakfast and lunch…the food is fresh, prepared like home-cooked, and they have great service! Clouds rolled in for the afternoon, with rain in the forecast for tomorrow. So, we took advantage of the dry weather today to paint the junction box for the winch remote plug-in, mount the box on the cabin, and complete the wiring from the solenoid to the plug-in. Next we’ll be working on the wiring for a system on/off switch and for connecting the battery charger. 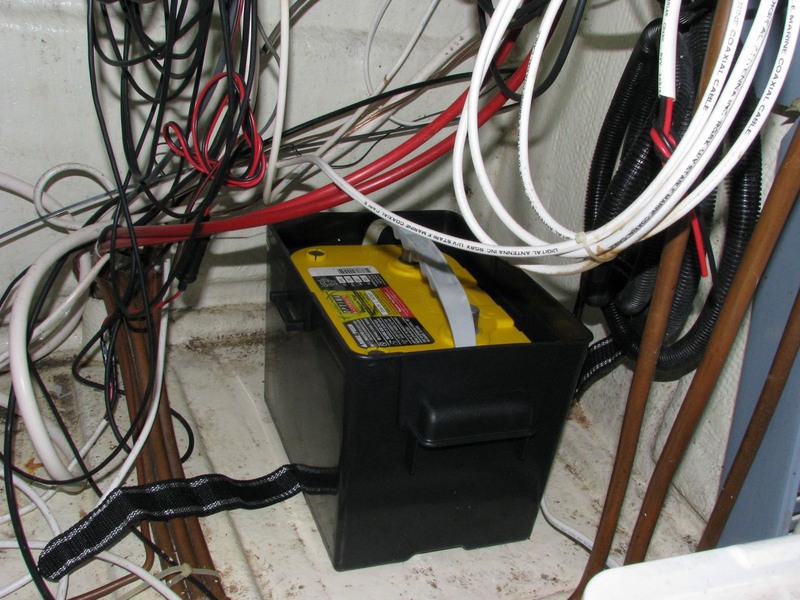 The Superwinch battery is stored inside a locker on our flybridge, and in a protective box that is tied down. The Superwinch solenoid now has wires on the left side that connect to the battery…the wires on the right are the ones that connect to the winch. Teak swimstep and boarding ladder before cleaning. The boarding ladder is stored in a folded position, on the port side of our stern. 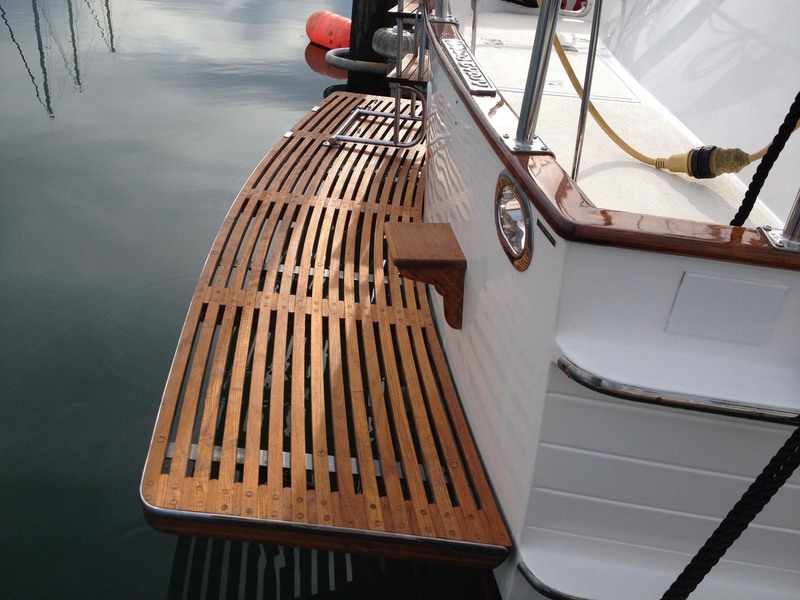 Teak swimstep and boarding ladder after cleaning. Connecting the battery and remote control to the solenoid is the next step of installing the Superwinch. We found a place to store the winch battery in the locker on the starboard forward end of the flybridge, then ran heavy battery cables inside the side wall of the flybridge to connect the battery to the solenoid. Wiring the remote control to the solenoid required a little more effort. First we had to decide where to locate the plug-in for the remote so that the 10-foot cord will reach the places we want to be when we are using it. The best place seems to be near the base of the mast, close to where the dinghy is stored on the boat deck. However, we couldn’t find a convenient place where we could recess the plug-in connection. After many rejected ideas, we settled on buying a weather-tight electrical junction box that will be mounted near the stairs to the flybridge and painted white to match the cabin. 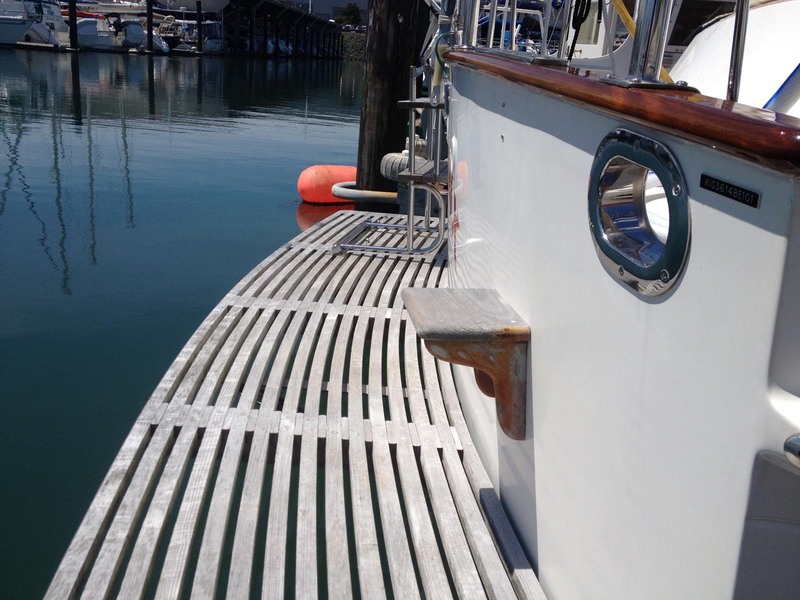 We had a dry day on Monday, so I was able to clean up the teak on the swim step and boarding ladder, using the same technique and product that I used on the teak decking a few days ago (see June 3 post). After some serious scrubbing, the dirty teak cleaned up pretty good and it was so nice to see the warm teak color return.